How can architects respond to the reactionary "hardening" of schools in response to mass shootings? - Archpaper.com How can architects respond to the reactionary "hardening" of schools in response to mass shootings? 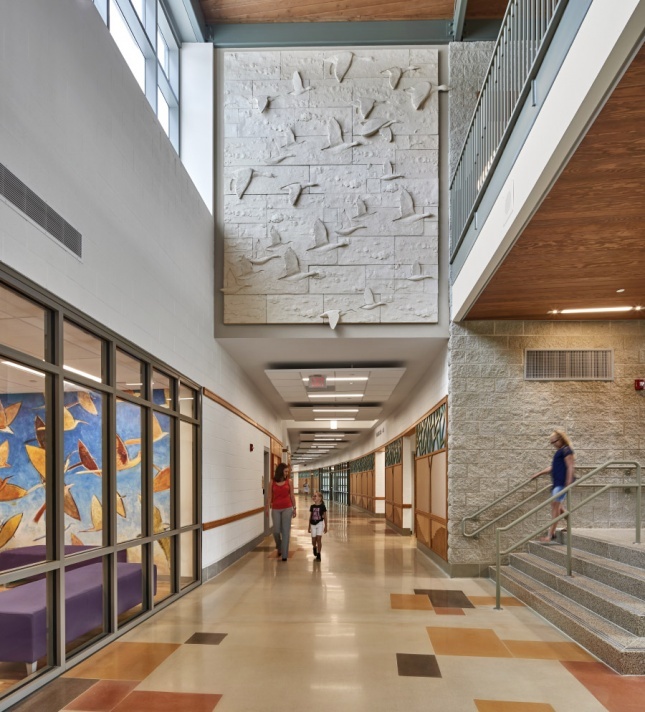 How can architects balance security and openness in school design after mass shootings? In the wake of the horrific mass shooting at Marjory Stoneman Douglas High School in Parkland, Florida, we the members of the American Institute of Architects Committee on Architecture for Education (AIA CAE), feel compelled to express our collective sympathies to all affected by this horrible tragedy. Since the school shooting at Columbine High School in 1999, there have been over 200 school shootings with nearly 150,000 Americans directly affected by these incidents. The courage, grace, eloquence, and poise of the students from Stoneman Douglas serve as an inspiration to us all. We hear their call for action and stand ready to support the cause. As architects of educational environments across the learning continuum, we look to Crime Prevention Through Environmental Design (CPTED) guidelines to help us design school facilities that discourage criminal behavior and bullying through the incorporation of unobtrusive security features that are compatible with positive learning environments. These include providing clear sightlines to parking lots from staffed administration locations, limiting building access to a single entry point with a sallyport design, target hardening through security glazing, enhancing passive supervision through interior transparency, territorial reinforcement through fencing and thoughtful landscaping, and other solutions. One of the dangers of these and other school hardening strategies, however, is that these measures alone aren’t enough. Sandy Hook Elementary and Marjory Stoneman Douglas High School had some of the “target hardening” elements described in many CPTED standards installed, and it didn’t stop perpetrators from entering the schools and causing tragedies. As architects, we are being asked to develop designs that provide for bullet-proof glass, secure entry vestibules, surveillance camera systems, etc. These can be beneficial to deter an active shooter and can also aid in providing deterrents for bullying and other unfavorable behavior, but they are not the exclusive answer. Our clients are being barraged with offers from various manufacturers about products that will shield students in the event of an active-shooter situation, and you can certainly understand the pressure from parents and community members to provide these measures and more to keep their kids safe. While we believe the safety and security of students, educators and administrators on school campuses are of paramount importance, it is our responsibility as architects, however, to serve as a counterpoint to some of these hardening tactics. We cannot let fear dictate design or advocate for designing our schools to resemble prisons. Our schools and communities deserve more from us. It is important to create spaces that are warm and welcoming to students, educators, and communities. We often work with schools, districts, and colleges to balance the need for safety and security with a strong desire for flexibility, collaboration and connection. In addition to providing enhanced security measures, we also need to look at research on provisions of “soft design” as well. In response to the MSD school shooting, we have seen many school and university officials, national educational organizations, affiliated organizations, and individuals come together as an interdisciplinary group to develop a “Call for Action to Prevent Gun Violence in the US” where they stress the importance of creating stronger, more connected school communities focused on development and identification of soft skills in students to reduce the incidence of isolation, depression, bullying and discrimination in our schools. The design of schools can and should be an active partner in this conversation. 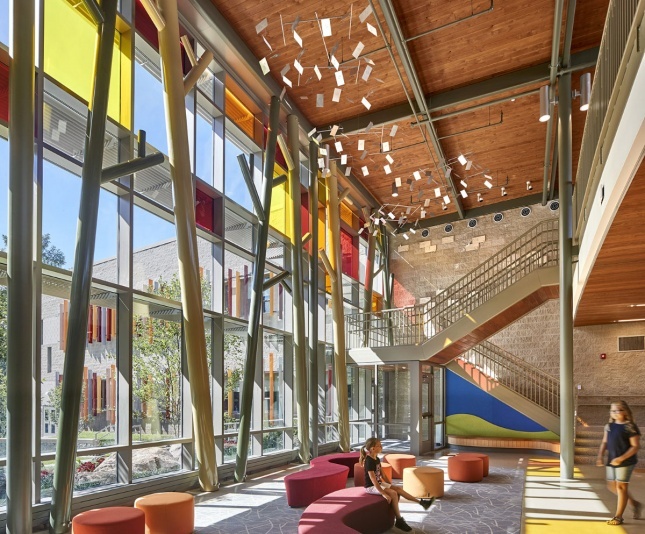 Through transparency, adjacency, and the creation of warm, welcoming environments, architects can provide the physical spaces to nurture these activities. Svigals + Partners redesigned Sandy Hook Elementary School in Newtown, Connecticut, after the horrifying 2012 shooting that killed twenty students and six adults. Today, it stands as a shining example of how to provide the highest safety and security features while emphasizing its educational mission and connection to the community. 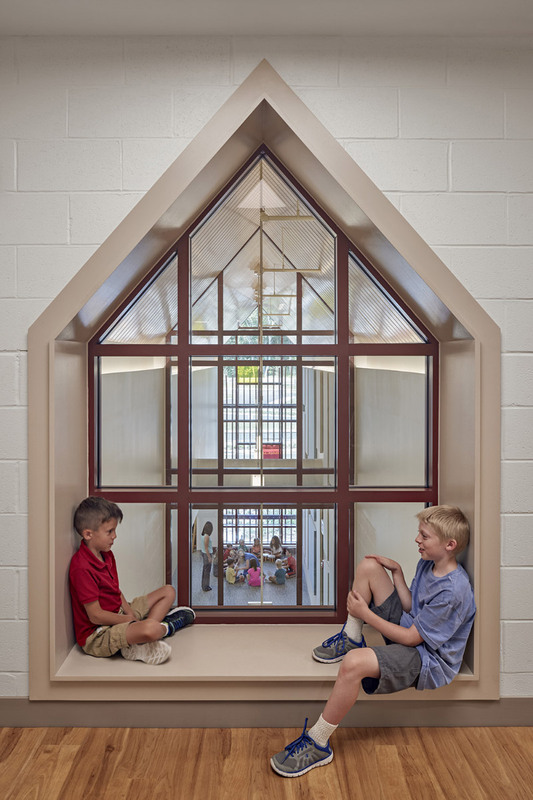 The members of the AIA CAE are fortunate in our work to bear witness to the incredible efforts of educators and administrators of public and private schools. In addition to their diligent focus on developing the knowledge, skills, and character of their students, we have seen how hard they work, within their often-meager resources, to attend to the social and emotional needs of their students. Today’s students face issues of stress, drug and alcohol abuse, anxiety, depression and mental illness in quantities never before seen. It is through this lens that we understand the critical need for space and resources to support the creation of strong communities where each and every student feels heard, accepted and loved. Design of collaborative areas, transparency, and informal learning environments are keys to supporting next generation learning practices and to creating a strong sense of connectedness within a school or university campus. Although it is an uncomfortable and often controversial topic, no conversation about school safety and security can be complete without addressing the issue of gun ownership and safeguards. Recommendations to train and arm teachers to protect their students are inconsistent with the expert advice from school resource officers, school administrators, and teachers we encounter every day as we work with them to design safe and nurturing school communities. The National Association of School Resource Officers, the leading organization in school-based policing, issued a statement in the days following the MSD massacre opposing arming teachers. In the discussions we have with our school and university clients across the country, it is often stated that the answer to providing greater security on school campuses is fewer guns, not more. The leaders of the AIA CAE have heard from school and university administrators, educators, and students that we need to join them to compel our legislators to enact common-sense gun laws that are supported by a vast majority of Americans. The protection of responsible gun ownership and the prevention of gun violence can both be achieved through thoughtful and forceful legislation that works in concert with mental health services and safe school design to ensure our schools remain a bastion of hope for our nation’s children. The voices of the Stoneman Douglas students and those from around the country that are joining them should inspire us all to be contributors to the solution. The time for words is over and the time for action is now. The leadership group of the AIA CAE continues to work closely with AIA National staff and officers to find ways to encourage a continued, multidisciplinary, and comprehensive dialogue around school safety and security. While working with a school community to envision their new school, we were recently asked, “How can the architecture support relationships?” This should be the lens we are using in designing our schools, and we as the AIA CAE look forward to continuing to develop opportunities at the national and local level to further this very important conversation. We hope you will join us! Karina Ruiz is vice chair of the American Institute of Architects Committee on Architecture for Education.